Why would U.N. Ambassador Nikki Haley pick Tuesday morning to announce she’ll step down at the end of the year, apparently catching her senior administration colleagues by surprise? For now, all we can do is speculate about Haley’s real motives. But it’s worth backing up and noting what people aren’t saying: no one thinks Haley’s resignation has much to do with the actual job she does, and everyone thinks she jumped, instead of being pushed. 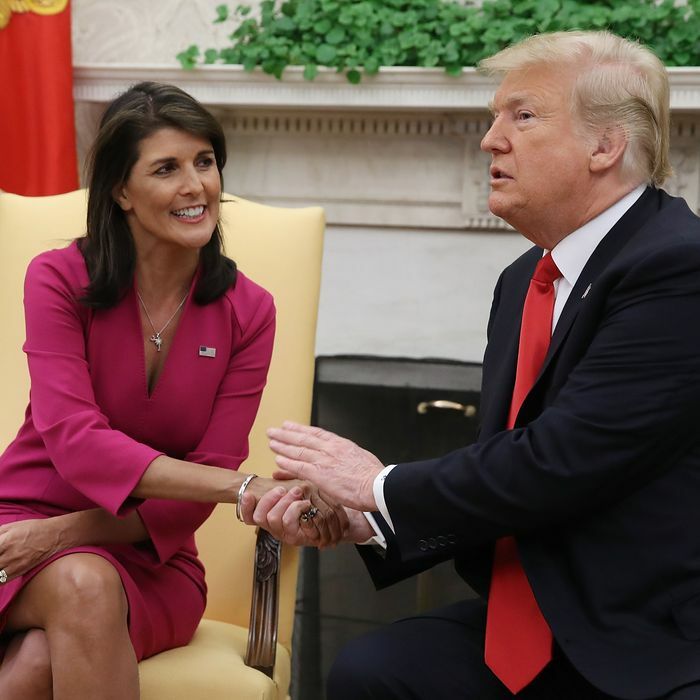 Amid all the chatter about Haley’s exit, her foreign policy differences with President Trump hardly rated a mention. This is worth stressing, because the differences seem to have been significant, and they’re key to the battle over the future of the GOP. Haley was clearly in the camp that favored more muscular sanctions on Moscow, in response to its aggressions in Eastern Europe and its attempt to poison a former Russian spy and his daughter on British soil. Back in April, she used an appearance on Face the Nation to preview additional measures she said would be unveiled the following day. When the announcement never came, White House officials said she had been “confused” — which she, in turn, emphatically denied. Though Haley has been an eager messenger of some of the administration’s actions that were most enraging to other U.N. members — explicitly threatening fellow member-states who opposed the U.S. on Israel votes, for example, and defending U.S. efforts to terminate whole swaths of U.N. humanitarian funding and refugee resettlement — she eagerly jumped into working with and through the U.N. Early on, she got pushback from the White House just for convening career State Department officials — her future staffers — to learn from them about her new job and how the U.N. works. The foreign policy fight among Republicans is real. It pits the old Republican Establishment who value alliances, international commitments, and even some foreign aid against the Millers, Bannons, and other far-right figures who see the world beyond our shores as little but dangerous “others” to be fought and foolish suckers to be fleeced. It is one of the defining struggles of our time. But Haley seems to have wanted to close out her time in government without taking a side. This has everything to do with how conservatives perceive their electoral math — there is no path to the presidency without voters who look at the U.N. and see not opportunities for cooperation but threats to American identity. Here’s the thing about Haley’s departure that was different: unlike just about every other official who has left Trump’s national security team, Haley did it her way. Although she was expected to clash with National Security Adviser John Bolton, the talk about her being pushed out had actually died down recently. “Nikki’s name just hasn’t come up lately,” a senior official told the Washington Post just two short weeks ago. Trump’s appearance at the U.N. last month was judged a success by his team — never mind that the chamber of world leaders laughed at the president during his speech. Given Haley’s decision to publicize her exit on Justice Kavanaugh’s first day on the bench, and as we head into the final stretch before a midterm election that isn’t expected to go well for Republicans, the “why” may be fairly simple. Haley has proven herself a shrewd politician, capably negotiating her way through one of the diciest areas of Trump administration policy with her dignity relatively intact. Perhaps she just decided to quit while she’s ahead.